I don't know about you, but I definitely can get stuck in a rut when it comes to shopping for gluten free food. I tend to only pick up the brands I'm familiar with and become reluctant to experiment with new ones that come on the market. A representative from Dietary Specials got in contact with me and asked if I would like to sample some of their range. Seeing as I've always been wary of cereal and bread products that claim to be delicious and gluten free, I figured it would be a good opportunity for me to try something new. Upon tasting I have to say that their cornflakes actually taste like corn flakes - crunchy and full of flavour and their brown ciabatta rolls are soft, fresh and not at all gritty or stale in taste! What a discovery! I hit the internet to gain more information about Dietary Specials. My initial search took me to their UK site, but they do have an Irish website at http://www.dietaryspecials.ie/. The site is pretty easy to navigate. There is an absolutely great section on coeliac disease with advice and help. Really, really informative. There's a blog and forum on there too. They also provide a list of products that they have available here in Ireland and each is listed with a convenient ingredients guide, so you know what you're eating. They have a pretty exceptional range of breads, pastas, cereal and a frozen gluten free range too. I am looking forward to picking up more of their products in my next shop. I recommend giving the Dietary Specials products a try. Their website lists Dunnes, SuperValu, Superquinn and Tesco as stockists. 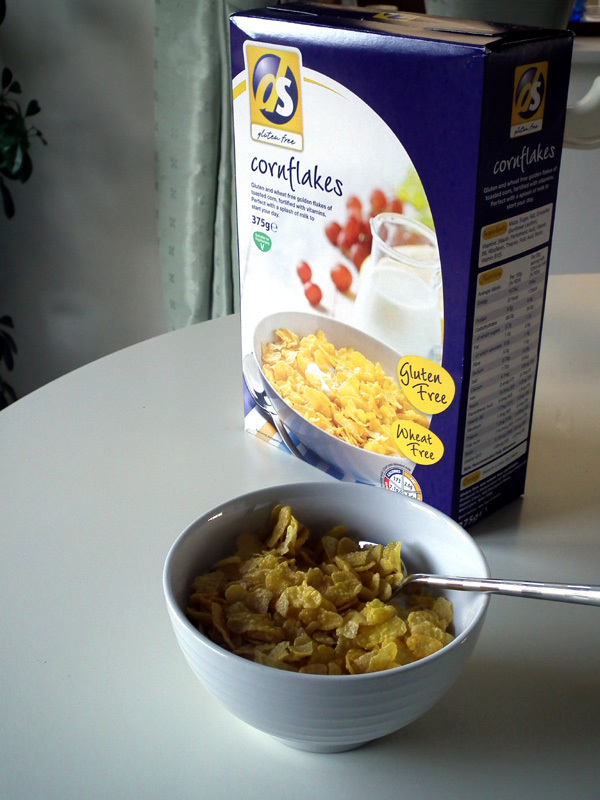 I have to say I am happy to enjoy a decent bowl of cornflakes in the morning again.